Charleston Farmhouse sits in a valley of the South Downs at the end of a long dirt road, marked private, which carves and winds around ditches of old trees. The house looks out upon farms and grazing, and just a little farther, the town of Lewes, East Sussex. Being mostly pacifists, the Bloomsbury set conscientiously objected to national service in the First World War, so the house at Charleston was bought in 1916 and there the group stayed, making the farmhouse a sanctuary for the things it believed in: literature, art, discussion, and new ways of doing things. They covered their sanctuary with pictures, portraits of each other, printed patterns on the tables and the ceilings and the chairs. ‘The house seems full of young people in very high spirits, laughing a great deal at their own jokes,’ Vanessa Bell wrote. The house belonged to Vanessa Bell and her family, husband Clive Bell and later lover Duncan Grant and her three children. But the house was never entirely a family homestead; it was visited daily by members of the Bloomsbury group, friends, lovers, curious types that warranted getting to know over tea and dinner and studio time. In fact, Maynard Keynes had his own room in Charleston. It was also a house often full of children. Looking at the house’s archives exposes the maternal sides of both Vanessa and Virginia, who never had children of her own. ‘The atmosphere seems full of catastrophes that upset no one,’ Virginia wrote in 1919, just after the birth of her niece Angelica had turned the house into a nursery once again. Vanessa Bell and Virginia Woolf were intimate sisters. Virginia wrote that they shared a ‘private nucleus’ after their parents died, with the responsibility of keeping house for their brothers. But later, when marriages and loves swayed their loyalties and attentions, the sisters found this nucleus often broken. One of the most separating forces in their partnership was Vanessa’s marriage to Clive Bell, and his subsequent ‘flirtation’ (as it has come to be known) with Virginia. Around this time, Vanessa painted Iceland Poppies, depicting three various vessels and three poppies, two white, one red, in a triangular composition. Vanessa’s biographer boldly attributed this composition to her discomfort caught between her old and new families. Recognising its personal importance, the Charleston Trust brought the painting back to the house at great cost, after it had been sold out of the family to a private collector. Now it sits in the dining room, holding a subtle magic over the corner of the room. The figure of Quentin Bell, Virginia’s youngest nephew, appears in great colour and detail in Charleston history. Growing up in the company of bold intellectual adults and in liberal but affluent conditions, Quentin was a rambunctious youth with artistic ambitions of his own. His birthdays were big awaited events in the Charleston household, with fireworks and the whole gang making a special effort. In 1930, Virginia describes in her diary how ‘the rockets went roaring up and scattered their gold grain,’ as they all watched in the garden. The house rings with Quentin’s spoilt but lively presence, and still holds annually the Quentin Follies, a silent auction mixed with cabaret and music acts. The kitchen is an important but rather back-stage room at Charleston. Naturally shadowy because of its place in the house but productive and furtive seeming, as if it’s always trying to provide a cooling atmosphere for a pie before a party. Charleston was an informal house; the Bloomsbury group would have boasted of that I’m sure, and as such, was much more self-sufficient than the family’s previous homes and townhouses. The house was pleasantly (according to Virginia) clear of servants, who as a general rule made her feel on edge in her own home. 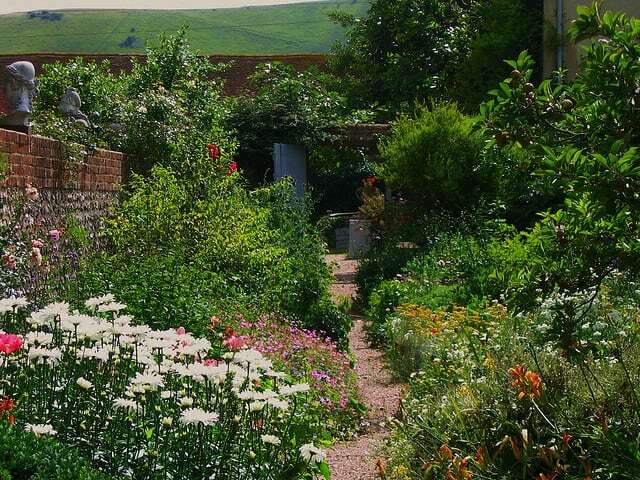 Image: Charleston Farmhouse Garden, Sussex; author: UGArdener; marked as free to share. Georgina Parfitt is a fiction and features writer based in Norfolk, UK, and editor at Towerbabel, a collaborative publishing platform for writers and readers. You can follow her on Twitter or find her non-fiction work at The Atlantic online, the Harvard Advocate and forthcoming in the Kings Review. Fascinating and entertaining. Thank you for these moments of the Bloomsbury group. A few years ago I stayed at Tilton House which is just down the road from Charleston ….we had a tour of the house and beautiful gardens …..a magical and fascinating place . Great post ! How fantastic to discover this on my very doorstep! I had no idea but it sounds wonderful! Brilliant! Great piece on a fabulous house–a must see for Bloomsbury tourists. Altho it was always Vanessa’s house, I don’t believe she ever owned it. In those days, everyone rented from the land owner. And they originally moved there so Clive and Duncan could be ‘farmers’ to avoid the draft as they were, as you say, pacifists. This was indeed incredibly interesting. Thank you for sharing this! Virginia Woolf has been on my mind a great deal lately, and yet I managed to overlook this post from Interesting Literature. For Woolf aficionados and others who just enjoy a bit of history, literary and otherwise: Read on! Well I never, a terrific little snippet of literary and social history. Must visit if in that neck of the woods. Thank you Georgina.